Some 12" singles only appear in my collection because they're cheap. I don't think I would have ever had this one if I'd had to pay more for it than I did back then. 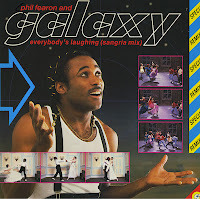 'Everybody's laughing' is a nice pop song, but nothing spectacular. Still, this 12" single is quite interesting, because it features an extended mix and two instrumental versions. One features Randy Muller (who?) 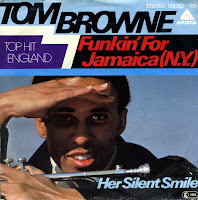 and the other Tom Browne, who had a hit in the early Eighties with 'Funkin' for Jamaica'. Tom Browne was introduced in the Netherlands by the influential TV chart programme Toppop. They recorded a clip of him and his band performing 'Funkin' for Jamaica', which subsequently became a number 3 hit for him in the Netherlands. Originally, Tom Browne is a jazz trumpeter, who worked with Sonny Fortune. His debut album 'Browne Sugar' did not trouble the charts, but the second album, 'Love approach', was more successful. 'Funkin' for Jamaica' features lead vocals by Tonni Smith. I bought this single during a record fair. My copy of the single was pressed on blue vinyl, a great collector's item.